I was pursuing twitter this morning, following all the wonderful Michigan conferences that I am missing, when I ran across a tweet from my friend, Michael Medvinsky. Michael was at home following the #zetacon hashtag, when he was inspired to act by writing a blog post and recording a video. Kevin Honeycutt was delivering the Keynote at Zetacon and asked “Why do you teach?” This is a very important questions for educators. Most of the time we share ideas about how we teach. Most conference focus on Pedagogy and “best practices”. 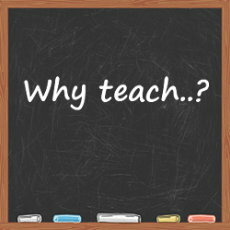 Rarely do we hear teachers share their WHYS for teaching. Often without knowing why people do what they do we have a disconnect and fail to appreciate their work. I know I missed some of my great inspirational teachers especially Jack Ridl from Hope College. Please reflect on WHY you teach. I hope you can share your story with me by either posting a comment on the blog or creating your own video on using the hashtag #iTeach on twitter. Have a great 2014-2015 school year. Always remember WHY you are doing what you do. Thanks Kevin and Michael for the inspirational reminder.